I started my Odessa hat right after I finished my first Inga hat. I really must have been in a hat knitting mood, because right after I finished my Odessa, I knit up a Fake Isle hat! I really enjoyed knitting the Odessa pattern. It kept my interest, yet it wasn’t so difficult that I needed to keep looking at the pattern over and over. This was the first time I used beads in my knitting, and it was much easier than I anticipated. The only think that irked me was that I encountered a knot in the yarn about an inch in into knitting the hat and I had to restring all my beads! I chose a DK weight yarn made by Cascade called Bollicine Dolly. It’s 100% extrafine merino and felt really soft in the ball. It’s not quite a soft knit up but it is certainly still comfortable enough to wear next to the skin. The beads I used were cheapo purple iridescent beads from Michaels, and I like how they shine all sorts of different colors! I can definitely say I will be knitting this hat again. 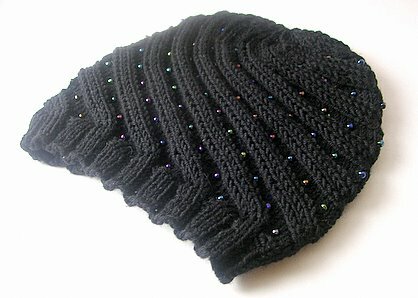 I think it would look pretty with Swarovski crystal beads, and would even look great without beads at all! *I tried so hard to get a decent picture of this hat... but it just wasn't happening! Finally I decided this was the best I could do.